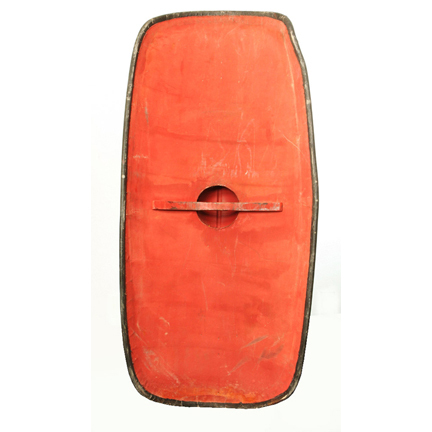 This Praetorian Guard shield was used onscreen in the Ridley Scott Oscar winning epic “Gladiator” starring Russell Crowe. 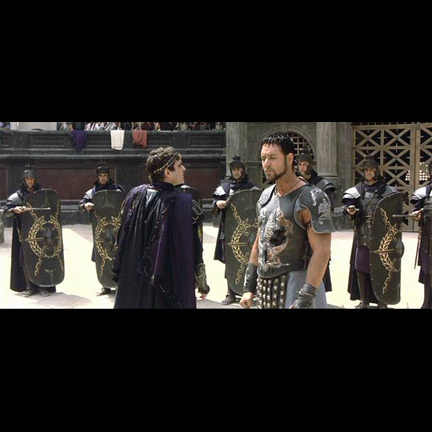 The black Praetorian Guard shields can be seen at various points throughout the film and particularly in the memorable arena scenes when the Emperor's trusted guards encircle the gladiators as the Emperor enters. 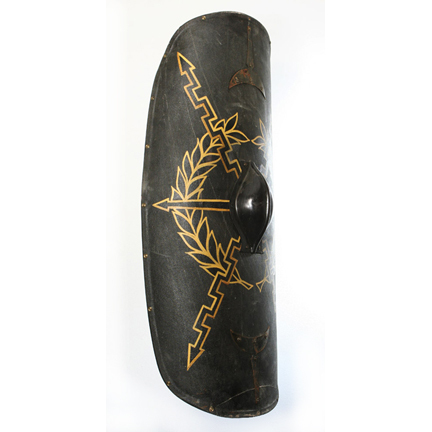 The curved shield has a canvas covering which is painted red on the back and black on the front with a gold colored Roman design and a plastic boss in the center which is also black. There is a wooden handle on the back. 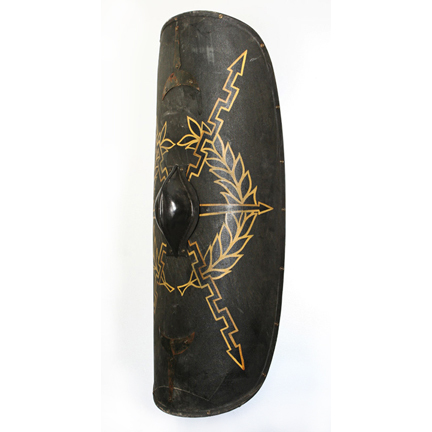 The shield is in good condition though exhibits evidence of use with small dents and scratches, mud, and wear. Measures 132cm x 59cm (52" x 23"). Accompanied by a letter of authenticity. 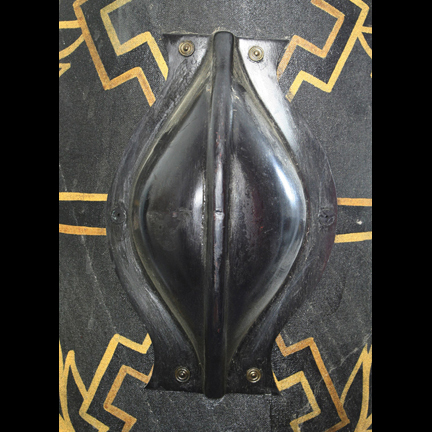 *PLEASE NOTE: The shield you receive may differ slightly in distress and wear from the one photographed here. 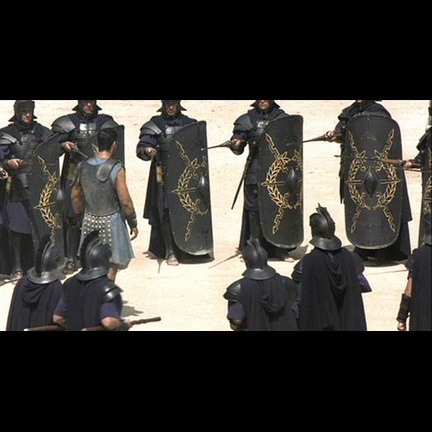 The Gladiator shields were heavily used and stored during the production, and always exhibit signs of use. 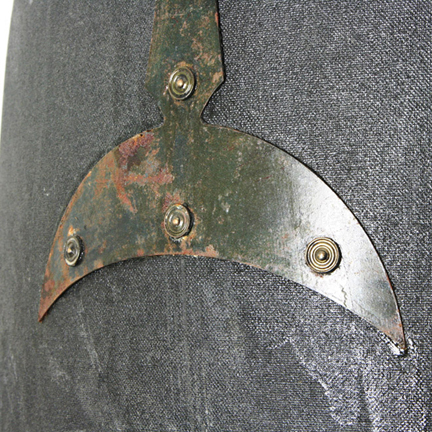 Your shield may also be missing a few of the small rivets that attach the center boss. The Golden Closet in conjunction with The Prop Store of London will donate 100% of the net proceeds on the sale of this item to the Clinton Bush Haiti Relief Fund via Ebay’s Giving Works Program. The Clinton Bush Haiti Relief Fund is a charitable foundation that provides assistance to the people of Haiti still recovering from the aftermath of the devastating earthquake that occurred on Jan. 12, 2010.